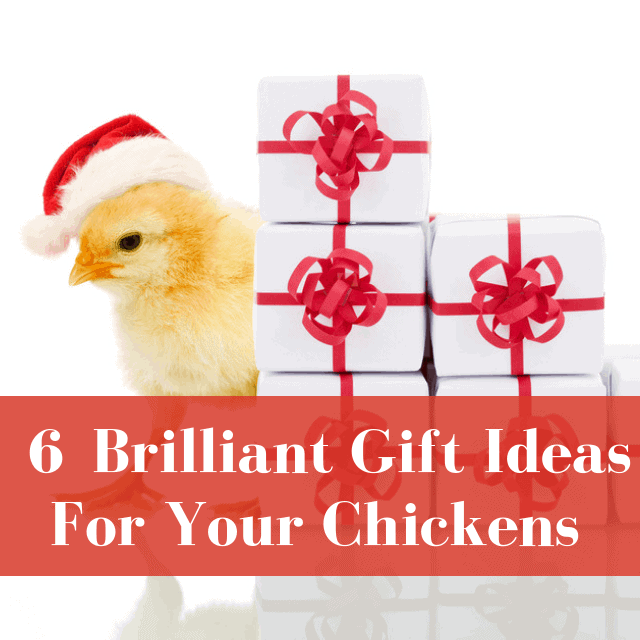 Today we are going to talk about the top five gifts for your chickens! Why should you get gifts for your chickens? It may seem like giving gifts for your chickens is somewhat frivolous, but if you’ve followed me for a while, you know that I support chicken toys!!! I think that they’re a good idea. Even though on the surface they seem frivolous and maybe a little bit ridiculous, at the same time, they do serve a very important purpose when it comes to your flock. As we know, chickens are very bright. They are smart creatures and given the right circumstances, things can turn into a Lord of the Flies situation very, very quickly. One concern that regularly comes up on the blog is what to do about chickens that pick on each other or develop bad habits. It is something that does happen! Chicken toys can be way to avert those bad behaviors. It’s a way to distract your chickens from developing those bad behaviors. When winter comes and the chickens tend to be in the coop more, bad behaviors (such as picking feathers, or picking on others) can set in very easily. And that can make your life difficult. So let’s talk about different toys you can get for your chickens that they will definitely appreciate this winter. Also just remember that even though we’re talking about things you can buy in this post, we’re also going to go over how to make them at home so you don’t have to spend money on them! The very first chicken toy product I wanted to talk about are chicken swings. Now chicken swings probably get the worst rap for being a frivolous item to purchase for your chickens. But chickens really do seem to enjoy them! What your chickens can do on the chicken swings is they can perch on it and they realize very quickly that they can use their weight to make the swing go back and forth. Chickens are smart right? Now let’s talk a little bit about how to make a chicken swing at home. Because as I’m sure you can imagine, these are actually not that difficult to make. And there is a little bit of an advantage to making it at home, which is that you can use naturally found items. On our farm I’ve found that using natural perches such as branches or logs does a really good job as a natural perch and the chickens seem to like it. I like how it lends a more natural look for our coops and runs. So when it comes to a chicken swing, go ahead and use a naturally found twig, branch, or wood! You will want to make sure that the branch you choose is fairly wide. Chickens don’t wrap their toes around perches, like other birds do. They tend to sit more flat footed so using a thicker circumference branch or log is a really good place to start. Now to make your chicken swing all you need to do is drill a hole in each end vertically on the log so that you’re able to put string or rope through it. I recommend using a thicker rope or twine, so that you can easily knot it after you put the string through your holes. You can tie it similar to how this old fashioned swing was tied in the photo below. I suggest using rope as opposed to something like chain. If you use something like a chain your chickens might get caught in it. Because let’s face it chickens are masters at getting into trouble. So I do suggest using something like rope because it’s more solid and they’re not going to get hurt as easily in it. Just have enough length of that rope so that it can get off the ground. I would definitely suggest keeping it close enough to the ground so that they still have access to it easily and it’s in their daily line of vision. Now the next item on our list is a xylophone. I’m talking about those children’s xylophones that have a lot of different colors on them. And obviously it’s a musical instrument so it makes noise. You’ve probably seen that video going viral on Facebook that shows chicken playing with a xylophone. I really this idea because chickens are very motivated by color. They do see color and they can distinguish colors and they seem to enjoy the idea of making music or at least entertaining themselves with the different tones of the notes. I do suggest going with a xylophone that has different colors on it because chickens are attracted to the different colors and I could see it just being a lot more entertaining to them than the noise itself. Now unfortunately, this is the one item on our list that I can’t really tell you how to make because I really don’t know how to make a xylophone. If you don’t want to buy one and if you have one hanging around, you can easily repurpose it as a chicken toy for your coop. Or you could check out local thrift stores to see if you could find one there! Now the third present for your chickens on our list are actually my Frugal Chicken nesting herbs. Basically what this product is, is its the herbs that I give my own chickens. It’s a custom blend that I’ve put together specifically because I believe that these are the herbs that you know help your chickens be healthy. Now one of the reasons I chose herbs is because they are specifically geared towards helping you raise healthy chickens. The way you use the product is you sprinkle the herbs in their nesting boxes. As your hens are laying their eggs, they’re going to pick at the herbs. So they’ll get the healthy benefits of it. You can mix herbs into their feed (depending on the herb). Either way will work very very well. Now if you do want to make this at home, all that you need to do is go ahead and buy the herbs separately and then just go ahead and mix them all together. Or if you happen to have them growing on your farm, that would be perfect to! My chicken nesting box herbs are all organic so if you have an organic farm, you can easily recreate these at home. I also sell lots of yummy treats for your hens too! One of my favorites is my Bee A Happy Hen Treat Mix. It’s a mix of bee pollen granules, hard red wheat berries, peppermint, parsley, mealworms, and rose petals. No joke, your hens will LOVE it! You can find it in our store right here. Now the next product on our list is MannaPro’s Mealworm Medley and a hanging basket to put the block into. Now the mealworm medley is, basically just a block of chicken treat. So it’s a single block about three inches by three inches and the nice thing about it is you can just put it in a hanging basket. It doesn’t last very long in my coop because my chickens love it so much! You definitely also want to get a hanging basket. It’s a heavy duty wire basket, that lets you suspend the treat, so that your chickens can peck at it and so that it doesn’t get dirty. You can also make the treat for the hanging basket from home! On the blog I have an article for making your own homemade suet treats that you can easily put into a hanging basket. I love this recipe because the coconut oil has a lot healthy fats in it for them and you can pick the ingredients you want to put in there. So you can put in sunflower seeds, mealworms, their regular feed, corn, or whatever works for you and your flock. During the winter you don’t have to worry about the coconut oil melting. Coconut oil has a 77 degree melting point and in most places it is much colder than that in the winter! Now obviously, we just talked about some treats for your chickens, but I wanted to talk about some other options you can give your chickens! You can also check out my book “Cluck Cakes” that has tons of treat recipes for your chickens! Since we’re talking about treats, the final gift for your chickens on our list is a treat dispenser. If you haven’t seen them, they work a little bit like Kongs for dogs in the sense that you can put the treat in it and your chickens have to figure out how to get the treat out. Once they figure out what it does, they’re going to play with it a lot! The one that I like is this one from Manna Pro: Manna Pro Treat Dispenser. But you can also easily make this at home with something like an old soda bottle or an old water bottle. All you need to do is poke some holes in the old water bottle, put the treats in the top, and then screw the lid back on. Then your chickens will try and peck the treats out of the holes! So that’s a very, very simple way to make it at home with products you probably already have on hand! You can put whatever you want in your treat dispenser! I would stick with dry foods though, so that it doesn’t get messy and gross. You can put corn in there, you can put mealworms in there, oats, calendula, or anything else you feel would work for your flock. That’s all for today folks! Are you going to buy your chickens gifts this year? If so, what are you going to give them?